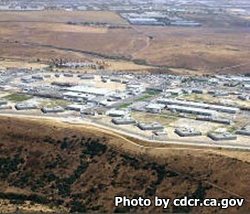 Richard J. Donovan Correctional facility is located South of San Diego County California. It houses over 3,600 inmates from medium to maximum security. Some of the more notorious inmates who served time at this facility were Erik Menendez brothers, who with his brother murdered their millionaire parents during the 1990's, and Sirhan Sirhan who assassinated Robert F. Kennedy. Inmates incarcerated at this facility can work a number of jobs including the coveted job of the bakery, in which inmates make thousands of loafs of bread that is shipped all over the state to various correctional facility. Inmates can also work in a shoe factory that manufactures shoes that are worn by inmates. Other vocational skills inmates can learn are HVAC, welding, machining and more. Offenders can also get an adult basic education, GED, take classes in coastline college, and participate in the 'Thinking for a change' program which teaches inmates self control and positive decision making. If you have submitted a visitors application and it has been approved, you can visit an inmate. The visiting hours are 8am-3pm on Saturdays and Sundays. If you arrive after 1:30pm you will not be admitted to visitation. Inmates who are only allowed non-contact visits must schedule a visiting appointment online here.